The attention of the great Indigenous People of Biafra under the command and leadership of Mazi Nnamdi Kanu has been drawn to various newspaper publications claiming that United Nations (UN), through their representatives, visited Enugu to congratulate Chief Nnia Nwodo led Ohaneze Ndigbo for their cooperation with Operation Python Dance II, in what they termed successful clampdown on agitations in the South East. The delegation we are led to believe, went on to reaffirm the United Nations' position on the indivisibility of Nigeria. We would like to use this opportunity to inform the worldwide family of IPOB and the rest of the civilised world that this purported visit from the UN never happened. In short, it is a fabricated lie designed to deceive the gullible and fool the discerning. Those that concocted these lies, cleverly packaged and sold to the masses, did so to convey the misleading impression that the illegal and genocidal Operation Python Dance had the backing of the United Nations. This is nothing but a black lie and grand deception of the highest order. Out of desperation to justify their treachery and complicity in the death of so many innocent people as a result of Operation Python Dance II, Ohaneze Ndigbo in concert with Aso Rock cabal hastily packaged a Ghanaian of Hausa Fulani ethnicity resident in Abuja to come and hoodwink the people into believing that Antonio Guiterres the current UN Secretary General is in support of the cold blooded murder of unarmed civilians in Abia State. 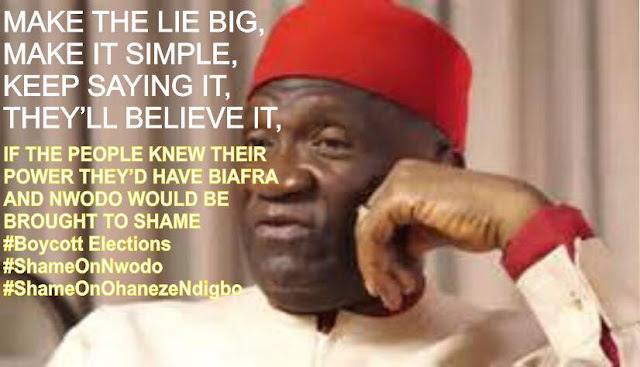 Could it be that this grand deception was hatched because the public have woken up to the reality that Ohaneze Ndigbo was the brain behind the murder of so many innocent people during Operation Python Dance II? It is clear that no high profile figure is willing to support Nnia Nwodo and South East governors in their treachery, hence the need to rent a former Ghanaian diplomat living in Abuja to launder their dirty image using the respected name of the United Nations. IPOB attorneys in New York have been instructed to write to the office of the Secretary General of the United Nations to seek clarifications on some of the quotes attributed to Mr. Ibn Chambas during his purported visit to Enugu, to understand if the United Nations is now openly endorsing ethnic cleansing and genocide in Biafraland. The provocative statements attributed to this Hausa Fulani Ghanaian supposed representative of the Secretary General of the UN, is the same unity begging One Nigeria mantra we have become accustomed to from the same Hausa Fulanis in Nigeria. So getting the same genocidal message from a Hausa Fulani from Ghana living in Abuja did not come to us as a surprise. What is shocking is that Nnia Nwodo and Igbo politicians are prepared to sink so low in order to cover their dirty tracks and in the process justify what is clearly unjustifiable. By traveling to Enugu to defend the interest of his fellow Muslim Hausa Fulani, Mohammed Ibn Chambas demonstrated that defence of his ethnic and religious group is paramount to him, unlike Nwodo that specialises in selling the interest of his people to the North. For record purposes Mohammed Ibn Chambas is not working for the current UN Secretary General Antonio Guiterres, he was appointed by Ban Ki-Moon as his Special Representative in West Africa. Everybody knows Ban Ki-Moon is no longer the head of UN. The question that investigative journalists must put to Ambassador Mohammed Ibn Chambas is this; when was he appointed by Antonio Guiterres to represent him in West Africa. Aso Rock cabal is using the name of the UN to shore up the dwindling relevance of Nnia Nwodo led Ohaneze Ndigbo in the South East by blatantly misleading the public into thinking the United Nations were behind this fake visit to Enugu. So the purported UN delegation to Enugu is a fraud, a political 419. Nwodo is digging his grave even deeper. Guiteres, the present UN chief did not appoint nor send Mohammed Ibn Chambas on any errand to Enugu. This confirms the level of panic at the heart of Ohaneze Ndigbo and their Northern handlers because nobody in Biafraland is willing to side with them in their evil plot with Arewa North to destroy IPOB. Nnia Nwodo is becoming too desperate because he has no credibility left. Before Aso Rock cabal and compromised Igbo politicians embark on this type of elementary deception next time, they should be guided by the fact that IPOB is the largest and most well resourced mass movement in the world. IPOB is not a small organisation that can be toyed with.